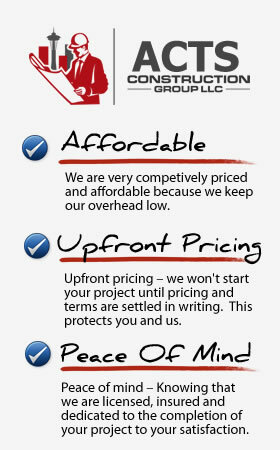 Need Siding Installed on Your New Construction Project? We specialize in the installation of different types of siding. Are you in the process of building a home or building and find yourself looking for a reliable contractor that can install siding? ACTS Construction Group LLC is a full service general contractor serving the Seattle, WA area. We specialize in the installation of siding on new construction homes and buildings. From the installation of new vinyl siding to fiber cement to cedar or even aluminum siding we’ll be able to side your structure so that it looks fantastic. Vinyl Siding: This is the most popular siding on the market today and probably the most affordable. Vinyl Siding can be very low maintenance and is usually fast and easy for professionals like WA Construction Group to install. Vinyl Siding is available in many different colors and patterns. If you are on a tighter budget than Vinyl siding is the most economical way to side your home. Vinyl Siding is stil a very good choice and when installed and cared for correctly will last a very long time. One of the more common mistakes, or “time-savers” you’ll see with other siding contractors is their lack of attention to the finer details of a siding job, like making sure ends meet up around windows, and other areas that need to be trimmed. Professionals will do a nice clean job for you, while the “other guys” will leave gaps, holes and other unsightly deficiencies with the installation. Why Choose ACTS Construction Group LLC For Your Siding Project in Seattle? When you choose to work the ACTS Construction Group LLC you are partnering with a team of construction professionals who have many years of experience installing siding on homes and buildings throughout the Seattle area. You can be sure that your siding will be installed correctly and will make your building look fantastic. If you’d like to receive an estimate for your upcoming siding project please give us a call 206-503-6200 or fill out our contact form and someone will be getting right back to you.